We received a tip yesterday that a landslide recently became active, probably in the storms that blew through the area in mid to late November. 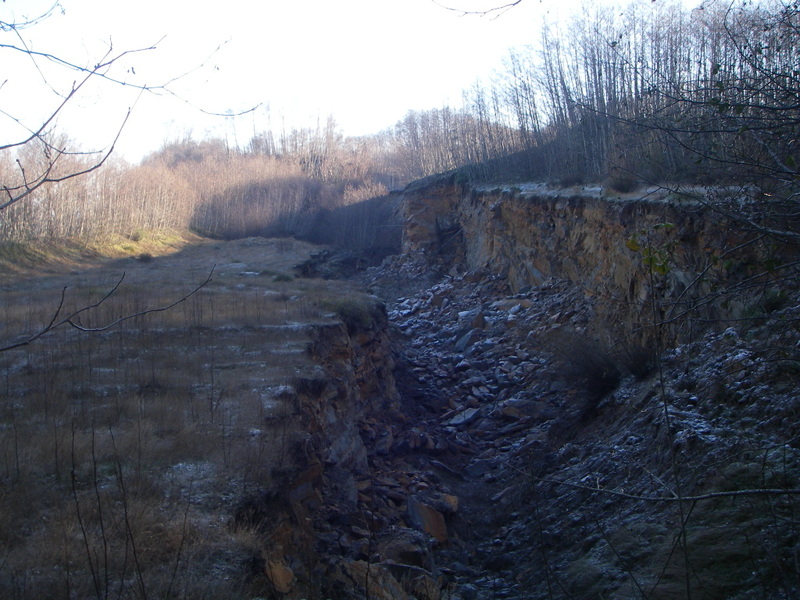 The landslide occurred in a quarry that has been inactive for some time. The highway south of the quarry is State Route 112. The quarry is an old clay mine that use to supply clay to the cement mills in Seattle. It is actually still owned by a cement company that has a working plant in Seattle. The report we got was the landslide had rocks that were actively rolling town a scarp and some of the pictures we received are amazing. The good thing, so far this landslide isn’t threatening any houses, pipelines, powerlines, or such. If it starts progressing uphill, it could eventually impact State Route 112, but at the moment it seems unlikely. The area of the site is part of the Miocene-Oligocene marine sediments of the Pysht formation of the upper Twin Rivers Group, which is locally interbedded carbonaceous and fossiliferous claystone, siltstone and some fine grained sandstone. A clay layer within the Pysht formation at the site was mined for cement manufacturing in Seattle. Also the Burke Museum has a whale skeleton (Miocene) from this quarry, probably by Jim Goedert. The Pysht formation also contains many near shore fossils, like bivalves and gastropods. So, we will keep our eyes out for another whale skeleton (although we might need a bigger truck). Before you think this would be a great place to head out, know that this area is extremely dangerous. Rocks are currently raveling down the scarps and toe of this landslide and sections of the landslide can move and give way at any moment. It isn’t worth your life to try and collect fossils here. The ground is torn apart and you could easily fall into a covered (or uncovered) crevasse and get trapped. 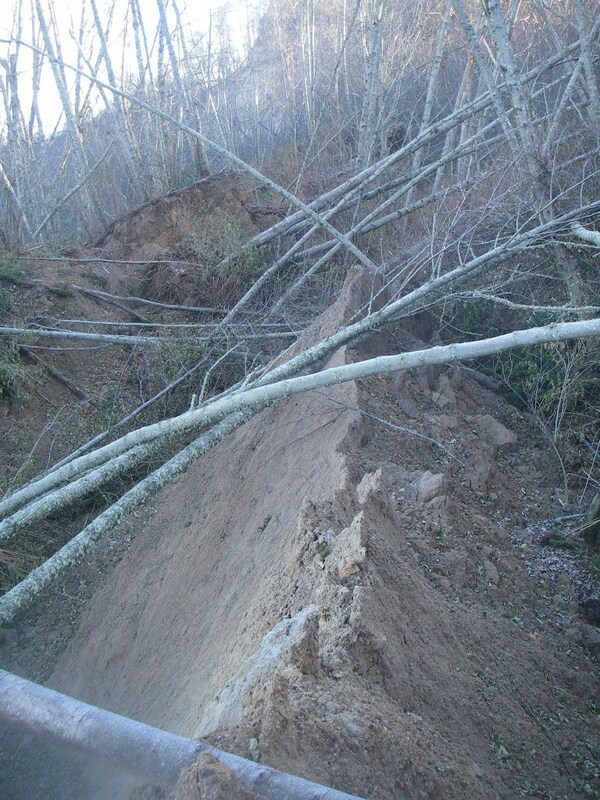 Sudden movement of the landslide or the snapping of tree roots could knock over trees without warning. This area is also private property and no tolerance will be given to anyone caught in this area, especially given the extreme danger that this area faces. If you would like to collect fossils from the Pysht Formation (or anywhere like that), contact the DNR Geology and Earth Resources Division, they can help you find safe and legal locations to collect on. Sometimes you get a Christmas gift you weren’t expected. I guess in this case, it was more of a birthday gift. 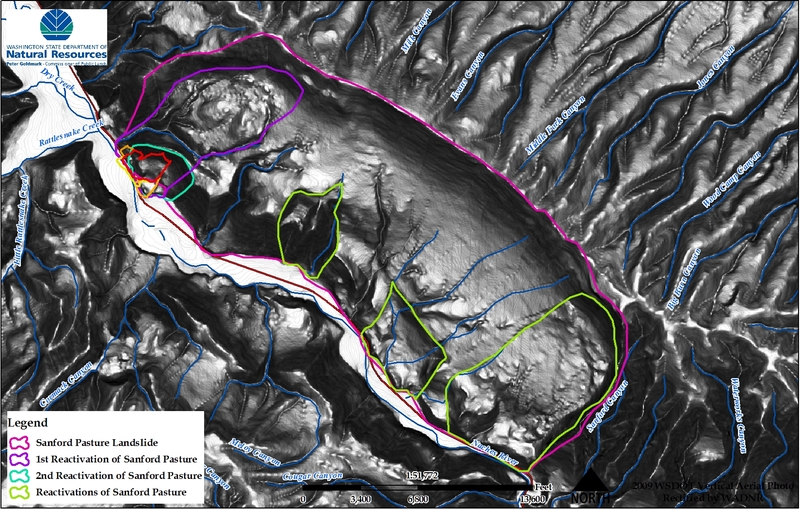 LiDAR for the Nile Landslide has finally preliminarily been released to various people to help in analysis on the landslide, but has not yet been released to the general public until the proper QA/QC has been established on the data. If you are working on the Nile Landslide (and I have talked with many of you already) and would like a copy of the LiDAR, contact me and I’ll see what we can arrange. I am going to analyze the lidar a bit more, but some interesting things. You can clearly see some of the uplifted areas, although it might not be as extensive as we previously thought. There are a few secondary landslides within the landslide mass, one major one by the quarry. Near the center of the landslide, there are some odd peaks (near the toe), not sure what those are, but I’ll try and find out today. Anyway, stay tuned, this is a key piece of data to help us understand the Nile Landslide. 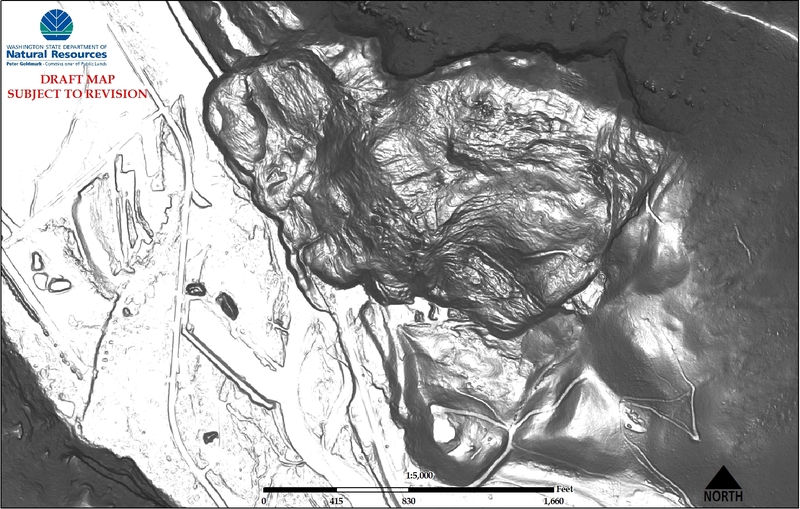 The Lidar also covers the Sanford Pasture Landslide as well and this will give us clues to the activity and morphology of this landslide as well. Well, we almost got through Thanksgiving without a landslide. There was another landslide on Chuckanut Drive near Spokane Street. The first time I saw reported was 11:45am on 11/26/2009. That makes 11 reported landslides so far. These little storms that roll through are really a wealth of information. 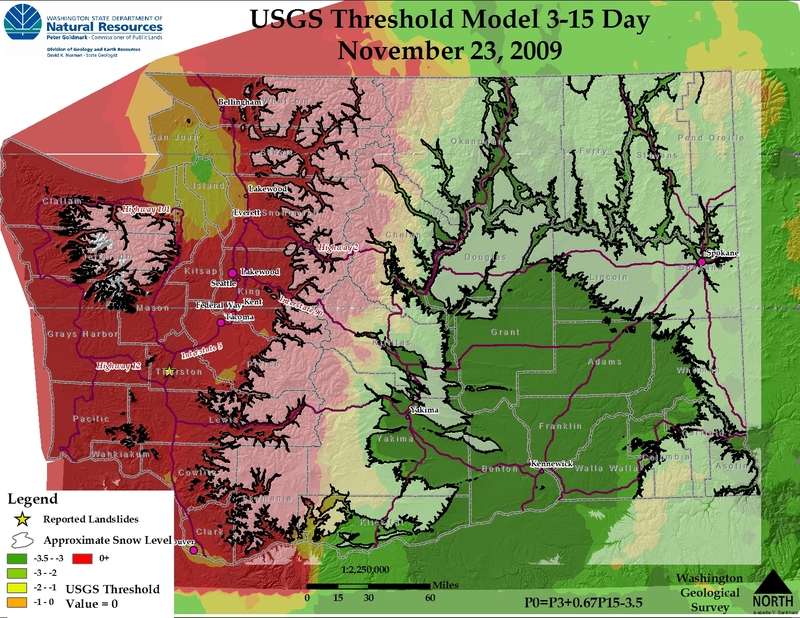 Since we are embarking on trying to make a landslide forecasting system, we need to figure out the precipitation thresholds. The nice thing is, these small landslides are probably failing just at the border of that threshold. The problem is figuring out the precipitation variables. As far as I can figure, it doesn’t look like the USGS Seattle Landslide threshold model is holding up in the rest of the state (nor should we expect it to). 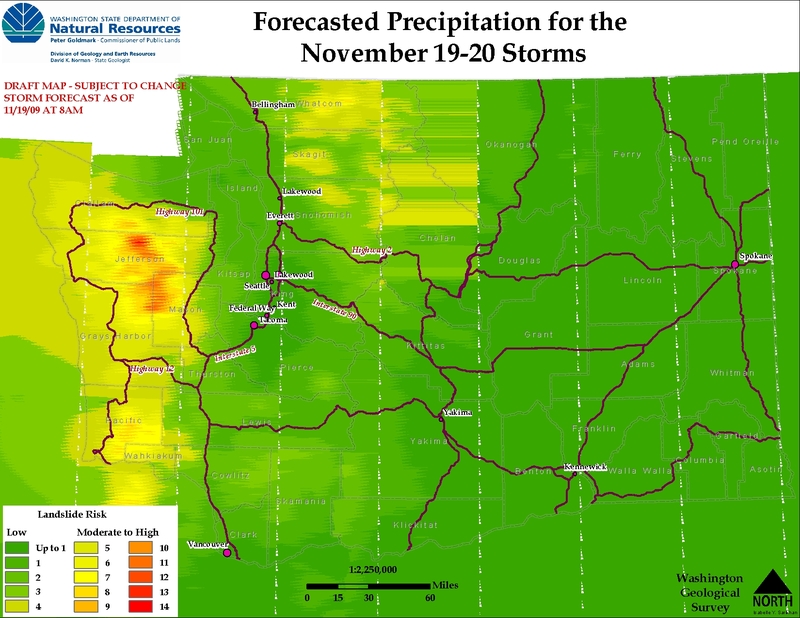 So, I threw together the precipitation data for a 3-day, 15-day USGS threshold models. We are assuming that the areas are probably at or very close to antecedent moisture threshold values. 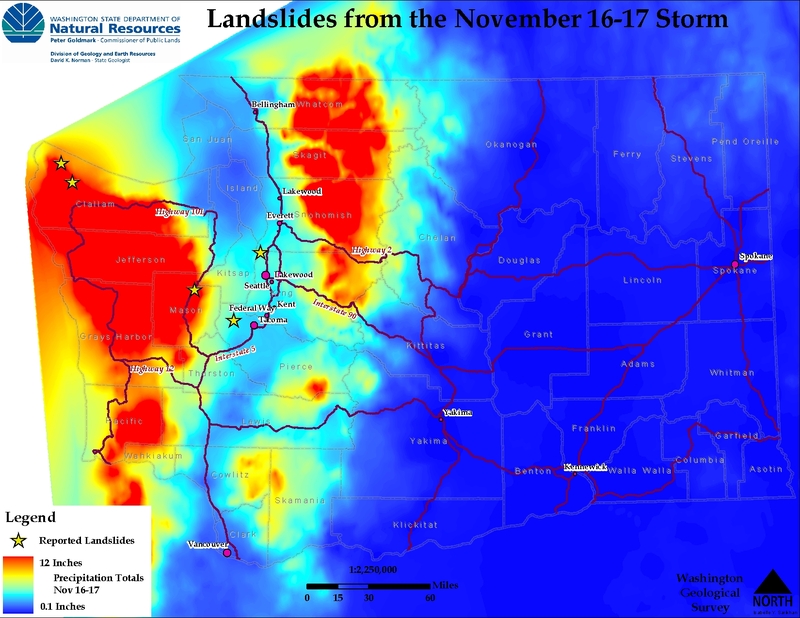 As you can see in the map, almost all of western Washington was above the threshold and guess what, we did have landslides. However, the amount of false positive that this map portrays is fairly concerning, unless there are a ton of landslides we haven’t seen. I guess the model is fairly simple in that it just says there is a likely chance that landslides could occur past the threshold. I think we might be able to improve upon this, maybe we can come up with a threshold model and as we pass the threshold, we can come up with a estimates landslides per acre, or something relevant that we could better plan or manage for an impending disaster. The biggest hurdle I am facing right now is, what sort of day ratio is the correct one. I don’t think the 3 day-15 day is going to work, or if it is, we need to drastically change the threshold value for various parts of Washington. Second, do we have indicator areas when the thresholds are starting to get reached, say, Chuckanut Drive or Eagle Cliffs down on SR 4. I have a dozen other questions, both those are foremost on my mind today. This morning there were only a few reported landslides, one that occurred near Port Angeles that unfortunately resulted in the death of Neal Richards of WSDOT, who was struck by a branch while working on clearing the landslide. The only other reported landslides so far was by Jefferson County, who said they have received reports of mudslides. As the morning goes on, we should be able to gather more information on these landslides. Two bigs storms are hitting Washington State, one blowing in last night, another blowing in this afternoon. So far, no landslides have been reported over major roadways or have made it into the media (although where we had rainfall so far isn’t well covered by the media). However, this last storm added water into already soaked hillsides, setting up the stage for the potential for sliding this evening and into tomorrow. We don’t have a forecasting system up yet (so far I have been swamped by other projects and haven’t been able to spend enough time getting it going). But, we can try and make some estimation of areas that will have a higher chance of sliding. I would put this akin to a back of the napkin calculation. This is our forecasted rainfall for the next day or so (including some of the precipitation from yesterday). The things to note in all of this, much of the higher elevations where higher rainfall is shown is mostly snow, I never parsed that out in the file. Next, I just used forecasted inches of rainfall to determine where the difference between low and high should be. It is a little arbitrary, but I did look back at the other smaller storms with somewhat similar soil saturations to help determine when we started seeing landslides initiating. This is more of an experiment at this time to see if we can make a really simplified forecasting system that tries and predicts which counties will be at risk of landslides during a storm. A note of caution, even in the low areas we can expect landslides, especially in urban areas. In less urban areas, water usually knows where it wants to go, has been going there for a long time. In urban areas, we have a lot more control over that water, we channel it on roadways and usually discharge it into sewers or into creeks. The problem, if a road channeling water is blocked (either by leaves, debris or some other thing), that water can be diverted, saturating a nearby hillside and causing a landslide, even though rainfall was low. This can also occur with property owners concentrating water on their property. There are a lot of other factors involved of course, but you get the idea. I talked with Gus Melonas of Burlington Northern Santa Fe. He said that the reported landslides are not quite landslides (well, one probably is a small slump or something). 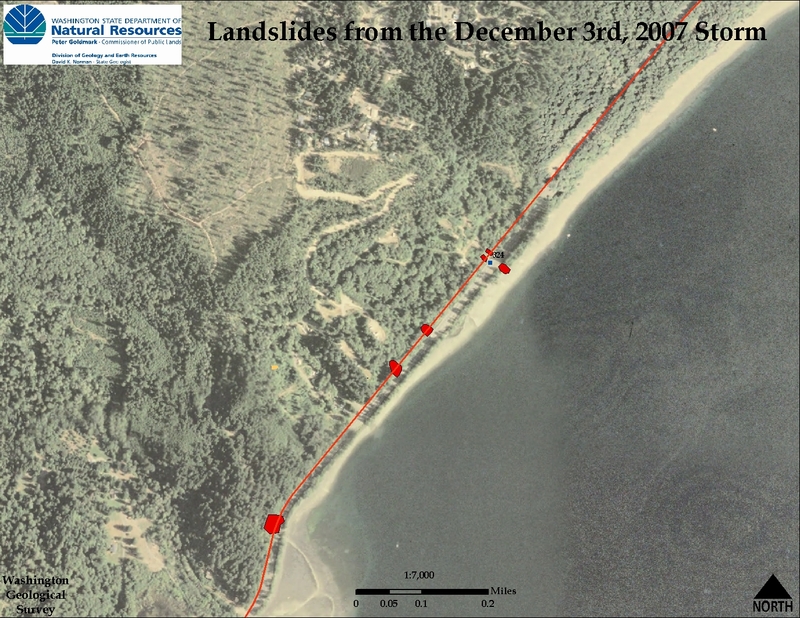 A landslide occurred 4 miles north of Carkeek Park on November 17th, around 6-7am. The landslide was about 30 feet in length, 4-6 feet deep (mostly brambles and blackberry bushes) and composed of mud (no rock). He said it didn’t flow across the track, but any landslide can close the Amtrak Service in that area, so sorry train folks, you have 48 hours to wait. The ‘landslide’ in Skykomish was only a tree that was blown over onto the tracks. 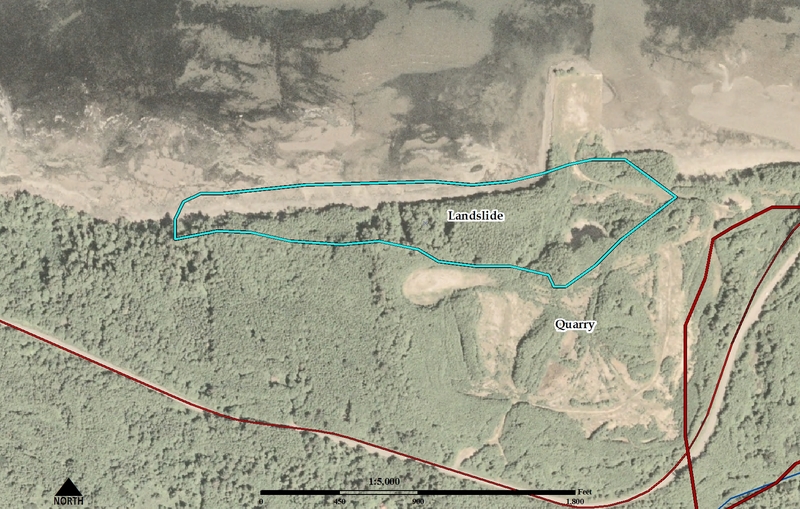 There is one other landslide, one reported up on the Hoko Drainage (Olympic Peninsula), reported by one of our Forest Practice Geologists who helps evaluate that area. That brings our total to 5 landslides from this last storm. Two landslides were reported on Burlington Northern Santa Fe railroad lines during this storm, but the news is slow to get out. A landslide in the Carkeek Park area north of Seattle closed Amtrak passenger service for the mandated 48 hours. Another landslide was reported to be on BNSF tracks near Skykomish (I suspected there were a couple of landslides up there). I am attempting to contact BNSF to get some more information on these landslides. I suspect we have a landslide or two up in the area north of Highway 90, but so far, nothing has been reported. I should have given the chance of landslides a bit higher than low to moderate, but at the time, the rainfall might not have been intense enough. We have a couple of landslides across Washington State this morning, most notably, a landslide out near Hoodsport on US 101 at milepost 324. The road was closed at 11/16/2009 9:39 PM, so the landslide occurred somewhere in the 9:00 PM hour. This is very near the same spot that a handful of landslides occurred on the December 3rd Storm in 2007 and this area is quite susceptible to intense precipitation (storm) events. Another landslide occurred on the Olympic Peninsula on State Route 112 at milepost 2.00. Apparently this occurred on 11/16/2009 at 1:00 PM, but I didn’t catch wind of it until this morning. A small landslide occurred in Gig Harbor today (Nov. 16), damaging a garage and two vehicles. The landslide occurred at 29th Street Court Northwest near Shawnee Drive around 1:30am. Landslides in urban areas, especially during these first storm events, could be caused by misdirected water or water inadvertently being directed into an unstable area. Something like a drain blocked by leaves causing water to flow onto the hillside. Unfortunately, I have been dealing with my computer dieing this morning, so I haven’t been able to investigate this landslide on the scene. Hopefully I will make it out there tomorrow. This ground is starting to get to a good saturation level. The chance is probably low to moderate for at least one or two more landslides around the Puget Sound Area from this storm.